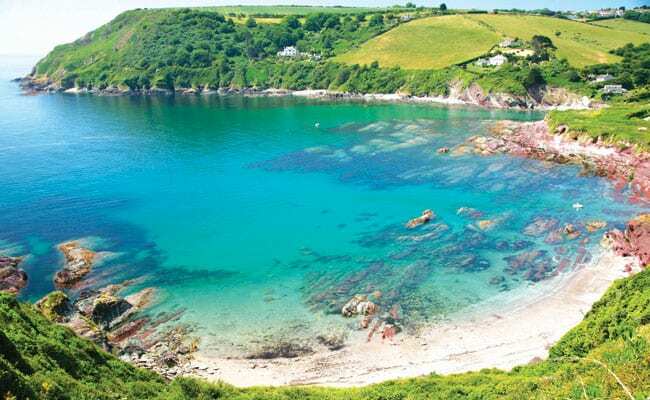 Holidays in Cornwall aren’t complete without a visit to a beautifully unspoilt beach, and the small coastal community of Talland Bay are lucky enough to have two. Between the historic fishing towns of Looe and Polperro, within easy reach of a wide range of 26 of our popular holiday cottages, the bay offers safe swimming, endless rock pools, and hidden coves, and is fantastic for fishing – perfect for all the family. Talland Sand and Rotterdam Beach are very popular, with licensed beach cafes on both that host barbecue evenings and live music throughout the summer. The bay was once a popular destination for smugglers and has also seen many shipwrecks including that of a French trawler- the Marguerite – in 1922. Two private boats performed a dramatic rescue to save all 21 people from the wreckage, the remains of which are still visible on the beach today at low tide. Picturesque Polperro and historic Looe are just a 5 and 10 minute drive away respectively, although the spectacular South West coastal path will get you to both with some breath-taking views. Both villages boast excellent award winning restaurants, as well as real Cornish pubs and a vibrant live music scene. The small village of Talland itself homes the ancient church of St. Tallanus and visitors to Talland Bay can see two large towers situated up on the hillside on the eastern side of the bay. Along the Looe coastal path to Looe, two more large towers are on the hillside above Hannafore. These are “measured mile markers” used by ships to calculate their speed. The fantastic beaches and coastal scenery aside, walking the coastal path and other local footpaths are a popular attraction. Many, such as the one to Tencreek, not only have fine views but are teeming with allsorts of wildlife – from skylarks, buzzards, butterflies and wild flowers like orchids to deer, foxes, crickets and glow worms it really is a hive of natural activity. Both a designated Area of Outstanding Beauty and a Heritage Coast, Talland Bay can boast one of the most unspoiled sections of the South West coast. The perfect balance beauty and tranquility existing only minutes from lively pubs and restaurants, it’s no wonder celebrity couple Richard Madeley and Judy Finnigan own a home there. With 26 different holiday cottages in the area, you too can experience all that the wonderful Talland Bay has to offer.